Does GDPR Impact Your Business? The General Data Protection Regulation (GDPR) is now here – impacting businesses globally. The GDPR (General Data Protection Regulation) came into effect on the 25th May 2018 and for the last 2 years+ there has been a lot of talk about it in the media. It would have been hard to miss it – even if you are outside of the EU. There was so much emphasis on the deadline and a lot of scare tactics too (it is true that non-compliant businesses could receive a fine of up to 4% of annual turnover). Now that the GDPR is here there are no more deadlines and if your business processes personal data (of people in the EU) you’ll need to ensure you have everything in place TODAY. GDPR does however introduce lots of opportunity too. The GDPR came into effect on the 25h May 2018. If you hold and process personal information about your clients, employees or suppliers that are based in the EU, you are legally obliged to protect that information. It doesn’t matter if your business is based in the USA or anywhere outside the EU, GDPR will still apply. Map your business’s data. What personal data do you have? Who has access to it? Where is it stored? Determine what data you need to keep. Only keep data that you need to keep. Put security measures in place. Does your website have a SSL certificate? Is your data encrypted? Establish procedures for handling personal data. Everything from collecting, storage, rectification and removals. What happens after everything is in place? GDPR Compliance is not a one off activity. Once all the above is in place it will be important to ensure they are enforced and kept up to date. 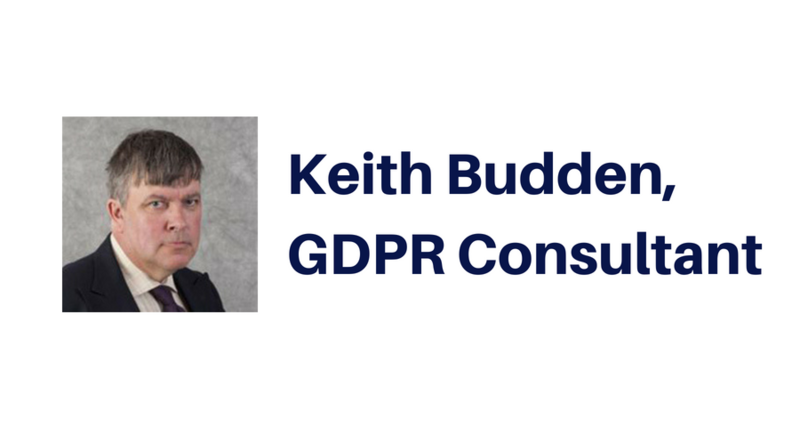 Keith has worked in data security and document management since 1997 (He was one of the first four people to introduce electronic document management to UK business way back then). He has worked with over 80 clients including British Airways, the Metropolitan Police, the Ministry of Defence and the Serious Organised Crime Agency (SOCA). Keith also has a number of high profile roles including being a board member of an NHS Clinical Commissioning Group. 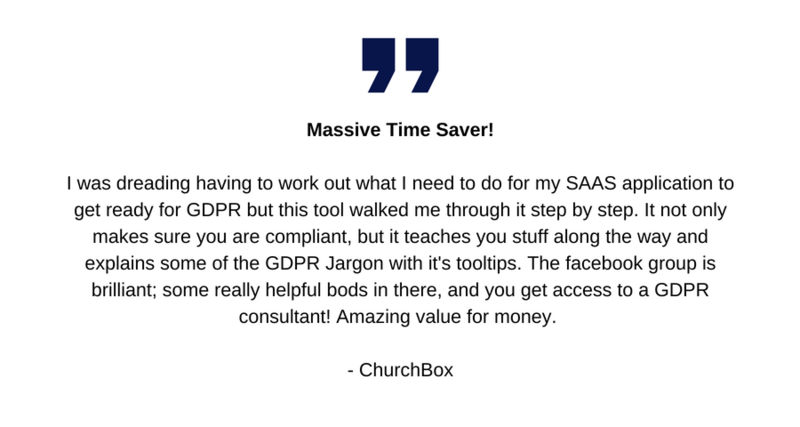 There are few professionals with his length and depth of experience, and now offer this experience to the business world to help them implement GDPR. The compliance deadline is May 25, 2018, which means any business that hasn’t reviewed its policies and practices is running out of time. Most of the media coverage of the EU’s GDPR has been focused on the ridiculous multimillion-dollar fines businesses can face. The GDPR tracker is an online tool that will guide you around the items that need to be considered under the new General Data Protection Regulations which came into effect in May 2018. The Tracker will advise you on exactly what you need to do to become compliant and stay compliant too. Once inside you’ll see that the system is straightforward. All aspects of GDPR get covered and split into sections. You work through each of the sections, answering questions about your business. Progress gets tracked so you know how much more you need to work through before you are compliant. Details about the actual regulations are right there in the system. No going back and forwards to many websites to find a part of the policy. At the end you can download everything to a PDF document which can be shared with anyone who needs to see how you comply (e.g. customers, regulators). A guide to what data your business needs to keep and how long for ensuring the correct procedures are in place. Instructions on what security measures you can put in place to ensure digital and physical data you hold is secure. Instructions on what you can and can’t do with data throughout your business. This will keep you on the right side of the law. When you buy the GDPR Tracker you’ll also get access to a private support group on Facebook with GDPR consultants on hand to answer all your questions. That service alone is worth more than the price of the software (See below). And you will avoid the huge fines for non compliance and keep your business running smoothly. Unlimited Access to GDPR Consultants. Access to new features at no extra charge. If you were to go out and put this package together for yourself it would cost well over $1,000 (without even thinking about developing the software). All the policy documents would cost in excess of $900 and GDPR consultants charge more than $150 per hour. 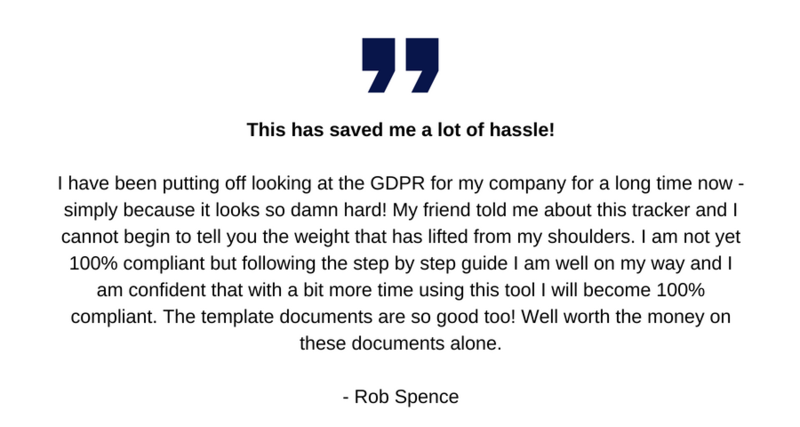 By using the GDPR Tracker to become compliant you’ll save hours (You know your business better than anyone else) and save a small fortune if you were to use a GDPR consultancy to do it for you. Fines of up to 4% of global annual turnover or 20 million Euros – which ever is greater will come into affect. Individuals will have right to request what data is held about them, which needs to provided to them within 30 days. Marketing will be difficult if you don’t have explicit consent – leaving you wide open to be reported to the ICO. All breaches will need to be notified to the ICO within 72 hours and recorded. 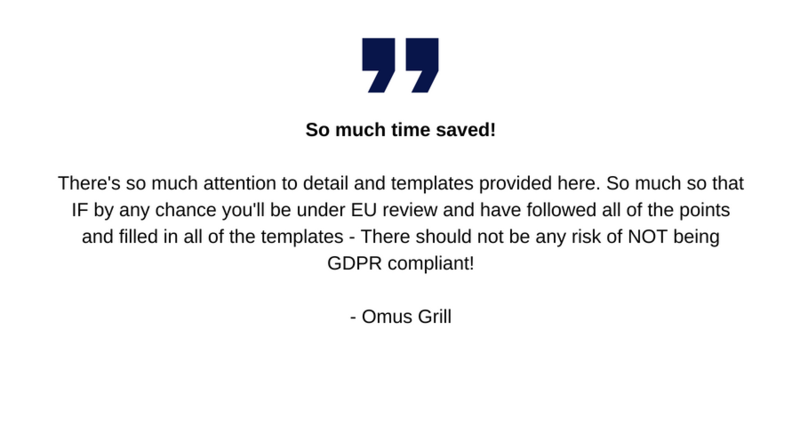 Is GDPR compliance a one off activity? Unfortunately becoming GDPR Tracker isn’t a one off activity. Once you have the key processes and procedures in place these will need to be maintained as and when your organisation changes and especially when you’re data requirements change too. Data subjects will have the right to access their data. As you introduce new systems and suppliers – Privacy Impact Assessments will need to be carried out. 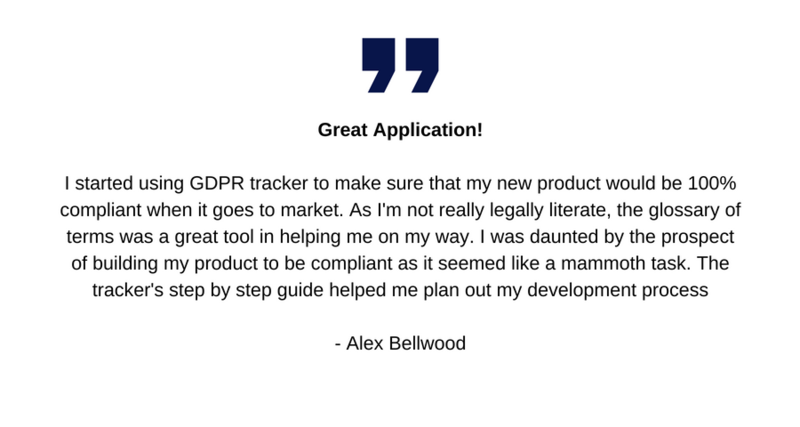 If your organisation is investigated or breached – you’ll have all your information in relation to the GDPR via the GDPR Tracker for easy of use in a single report. Who does GDPR apply to? / Who is the GDPR Tracker for? Any organisation which processes and holds the personal data of data subjects residing in the EU will be obliged to abide by the laws set out by GDPR. This applies to every organisation, regardless of whether or not they themselves reside in one of the 28 EU member states. Our GDPR consultants have worked in data security and document management since 1997 and registered with the ICO. They have worked with over 80 clients including British Airways, the Metropolitan Police, the Ministry of Defence and the Serious Organised Crime Agency (SOCA) – including international clients too. What effect, if any, does Brexit have on GDPR? Even though UK Prime Minister, Theresa May, has now announced a definitive date (29th March 2017) to begin the process of leaving the European Union, Brexit is still expected to take at least two years to take full effect, therefore, UK businesses still need to become GDPR ready by 25th May 2018. We offer a 30 day money back guarantee – no questions asked. After that there is a 30 day notice to cancel monthly accounts. For the yearly offer the account will be cancelled after 12 months has passed.